THE Managing Director (MD) of the FBN Bank Ghana Limited, Mr Gbenga Odeyemi, has expressed confidence in forex measures by the Bank of Ghana (BoG) to contain the fall of the cedi against the major foreign currencies. He explained that he was optimistic that recent developments in the economy would turnaround developments on the foreign exchange market. Since the beginning of February 2019, the cedi has been depreciating significantly and is currently hovering around US$5.3 to US$5.5 – a situation business associations have described as worrying. “We believe that the recent depreciation of the cedi against major foreign currencies are temporal and will soon be addressed following strong measures by BoG,” Mr Odeyemi told the media on March 1 in Accra. 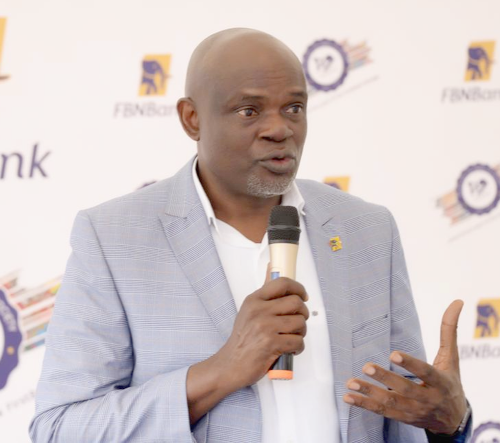 It was an event to commemorate the 125th anniversary celebration of the FirstBank of Nigeria Limited, a subsidiary of FBN Bank which is slated for March 31, 2019. The event was climax with a flag raising ceremony which symbolises the identity, impact, permanence and reverence of an institution. Mr Odeyemi stated that as a subsidiary of this long-standing institution, the bank has come to stay and to contribute to the country’s development; woven into the fabric of society. “From that very modest beginning in 1894, our parent bank, First Bank of Nigeria, has traversed an incredible journey of delivering impeccable financial services to its customers and support the building of the modern-day Nigeria and indeed, West Africa, including our early pivotal role as the monetary and fiscal policy regulator of the entire sub-region. “Today, we celebrate 125 years of unbroken business operations in Nigeria, supporting and enabling dreams, resilience and relevance, trust, safety and security and long-term value to all stakeholders,” he said. On recapitalisation, the MD stated that the FBN Bank was part of the 23 universal banks that met the GH¢400 million capitalisation deadline of the central bank. According to him, management of the bank expects the new capitalisation to position it to take advantage of the huge opportunities in the economy. He said it would also enhance FBN Bank’s competitive edge and enable it to deal with new challenges. “With the present state of the industry, the development is to make the bank more efficient, especially at a time when the central bank has stopped granting waivers for single obligor limits,” he added. Mr Odeyemi stated the bank would continue to focus on the agricultural sector in order to help fast-track the economic development of Ghana. Towards that end, he has announced plans of the bank to partner the central bank to provide assistance to individual farmers in the country to boost the agricultural sector. “Agriculture is an area that we are equally interested in and we will be partnering with the central bank to provide support to boost the sector,” he said. He added that the bank would continue to maintain a cautious approach to growth with a strategy to capture the unbanked, while introducing a new customer-interest product onto the market.